1 of 2 Cover sweet potatoes with cold water and bring to a boil. Reduce to a simmer and cook 12 to 15 minutes or until knife-tender. Drain and return to pot. Mash potatoes with a potato masher, then stir in milk, butter, pineapple, brown sugar, pumpkin pie spice and salt. 2 of 2 Transfer mixture to a 2 1/2-quart oval casserole dish; smooth out top. 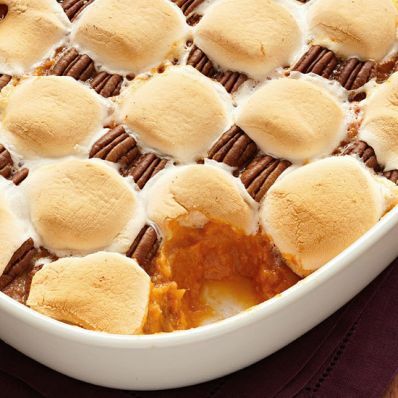 Starting at the top left, alternate one marshmallow with two pecan halves until the entire casserole is covered. Bake at 350 degrees F for 25 to 30 minutes, or until marshmallows are browned and puffed. Per Serving: 6 g fiber, 343 kcal cal., 191 mg sodium, 5 g pro., 11 g Fat, total, 59 g carb., 4 g sat. fat, 17 mg chol.